We’d love your help. Let us know what’s wrong with this preview of Death on West End Road by Carrie Doyle. An unsolved crime is something that Hamptons innkeeper and sleuth Antonia Bingham just can’t resist. Despite a busy high-season schedule and an inn booked to capacity, Antonia has agreed to investigate a cold case in her beloved adopted hometown, East Hampton, NY: the killing of Susie Whitaker, whose brutal 1990 slaying on a tennis court in the poshest part of town was nev An unsolved crime is something that Hamptons innkeeper and sleuth Antonia Bingham just can’t resist. Despite a busy high-season schedule and an inn booked to capacity, Antonia has agreed to investigate a cold case in her beloved adopted hometown, East Hampton, NY: the killing of Susie Whitaker, whose brutal 1990 slaying on a tennis court in the poshest part of town was never solved. To ask other readers questions about Death on West End Road, please sign up. Death on West End Road by Carrie Doyle is part of her A Hamptons Murder Mystery series. In this book Antonia Bingham is busy running her inn, which is booked to capacity for the Summer season, but when Pauline Framingham asks her to investigate a cold case in the murder of her friend, Susie Whitaker, Antonia agrees. This won’t be an easy case to solve because it happened back in 1990, the crime scene is compromised, the circumstances are complicated and the former witnesses are skittish and less Death on West End Road by Carrie Doyle is part of her A Hamptons Murder Mystery series. In this book Antonia Bingham is busy running her inn, which is booked to capacity for the Summer season, but when Pauline Framingham asks her to investigate a cold case in the murder of her friend, Susie Whitaker, Antonia agrees. This won’t be an easy case to solve because it happened back in 1990, the crime scene is compromised, the circumstances are complicated and the former witnesses are skittish and less than forthcoming with what they remember from so many years ago. The deeper that Antonia digs for answers the less things make sense. Running her inn smoothly is a top priority for Antonia as well but the ghosts of the past won’t let her rest. Antonia gets a few surprises of her own when a guest returns with a secret to tell, and a love interest returns which causes hope to spring in her heart. Can Antonia solve the mystery of who murdered Susie Whitaker or will this case continue to go cold and justice unserved? Death on West End Road is the first book that I have read by Carrie Doyle and I have to say that I thoroughly enjoyed it. Antonia is a very engaging main character and immediately grabs you and pulls you into the story. You see her reluctance to get involved with this case right from the beginning because it’s peak season for the Hamptons and she wants to make sure that her inn runs smoothly but is persuaded to investigate nonetheless because of her previous successes solving mysteries. Pauline is a very determined woman and we come to see that she is very manipulative as well. Pauline has lots of secrets and quite a few that connect back to what happened to her friend. Antonia is warned many times by those who were suspected, questioned and cleared to let this case go. She’s told that Pauline likes to stir things up and have people jump through hoops but Antonia pushes on. This story is very well written and has quite a few unexpected surprises. This is a who-done-it novel that really keeps you wondering who the culprit is until nearly the end when all the pieces start to come together to solve the case. Antonia deals with so much from: helping a customer find his second love, to dealing with a guest who returns with more than a couple secrets, to even threats against her reputation. There is hope, despair, confusion and jealousy. This book really gives it all to you and in such a dynamic way that you can’t help but keep turning the pages. Death on West End Road is a cozy mystery that packs it all into one book. It is interesting, funny, has just the right amount of romance, has just enough danger that threatens the main character and an ending that one really can’t complain about at all. I really enjoyed reading this book and I will be going back and reading other works by this author as well. If you are looking for a cozy mystery that will keep you engaged to the end then this is a book I recommend. Set against the background of Long Island’s exclusive East Hampton community, Death on West End Road kept me guessing the identity of the murderer until the last. I enjoyed the way the author first identified a number of suspects with creditable motives for the 20 year old cold case and, through initial interviews, uncovered surprising connections within that pool. Re-examination of the information revealed even more motives, leading to another look at each individual. I changed my candidate for Set against the background of Long Island’s exclusive East Hampton community, Death on West End Road kept me guessing the identity of the murderer until the last. I enjoyed the way the author first identified a number of suspects with creditable motives for the 20 year old cold case and, through initial interviews, uncovered surprising connections within that pool. Re-examination of the information revealed even more motives, leading to another look at each individual. I changed my candidate for the culprit several times before the surprise of an ending. The differences between the wealthy residents and their privileged lifestyle are sharply contrasted with the lives of the working class and merely well-to-do. And, once again, I was struck by how much power established wealth can wield. Antonia, the main character, remains somewhat of a mystery to me. I longed for more background on her and how she came to move from her California origins to be an innkeeper on Long Island. Another character I’m curious about is an older man named Joseph who makes the inn his home and who is presented as a friend and confidante of Antonia and who helps her with the mystery through online research. Larry Lipper, a newspaper reporter, provides both comic relief and insight. I loved the scenes depicting Antonia’s and Larry’s interactions. I’m eager to read the two previous volumes in the series with an eye to learning more about Antonia and her close companions. The book introduces some additional information about the innkeeper/sleuth that is sure to be explored in the next installment. I’m looking forward to it. Innkeeper, Antonia Bingham, is hired to play amateur sleuth in a cold case. One thing Antonia loves is playing amateur sleuth. This particular case happened in 1990 when a teenager was murdered. Oddly enough, she’s hired by the prime suspect in the murder, Pauline Framingham. Antonia’s investigation leads her in a dangerous direction which could cause her to lose the lovely East Hampton inn she has grown to love. Not to mention that many lives seem to be in danger since the investigation has sta Innkeeper, Antonia Bingham, is hired to play amateur sleuth in a cold case. One thing Antonia loves is playing amateur sleuth. This particular case happened in 1990 when a teenager was murdered. Oddly enough, she’s hired by the prime suspect in the murder, Pauline Framingham. Antonia’s investigation leads her in a dangerous direction which could cause her to lose the lovely East Hampton inn she has grown to love. Not to mention that many lives seem to be in danger since the investigation has started up again. This is the third book in the series. I did not read the previous two books, but I really want to. It would give me a better feeling for the characters. The story itself is self-contained in this book. It’s not a continuing storyline, but I do think it would be beneficial to read the first two books. I want to know Antonia better. It seems like she has an background to read about. It took me some time to get into this book, but when I did, I couldn’t put it down. I had to know who was involved and what the scenerio involved in this cold case was all about. It’s touching how Antonia grew to care about the victim, who she never met, but I could also understand it. I cared too. There were many twists and turns along the way. I didn’t see the ending coming at all. I knew something was up, but I didn’t put it all together quite accurately. The author did a great job of keeping the readers guessing and captivated until the end. Who killed Susie? That's what this book is about. Susie's death is a cold case from years ago. Lovely and just a tad "nosy" innkeeper Antonia has been tasked to find out exactly what happened to sweet Susie. Susie's best friend Pauline hires Antonia to solve Susie's murder. The question really is why now...what are Pauline's motives? We know there have to be ulterior motives. I read and loved the first two cozy mysteries that involved the lovely innkeeper Antonia. This third book had many of the same characters that I have come to enjoy... from the kitchen staff to the gardener...this is a fun series. Antonia and her annoying reporter pal Larry Lipper...make this book fun. Larry Lipper is a character who is so much fun to read about but someone you really don't want to know in your real life. Antonia and Larry are becoming a crime solving team. They pursue and they don't give up. They kind of break a lot of rules. They seem to have interviewed every person in the Hamptons in this one! Other characters that I can't leave out are Joseph...Antonia's dear friend...who always has her best interests at heart and her fun clothes loving BFF...Genevieve. Death on West End Road by Carrie Doyle is the third book in her Hamptons Murder series but I think it is the best so far. I love that it is about solving a cold case murder that leads to some fascinating circumstances. It has an ominous feel right from the start. Things seem off when Paula asks Antonia to find who murdered her friend years ago and prove it wasn't her. It gets stranger as she starts interviewing the people who were involved years ago with Susie and the stories are not adding up. A Death on West End Road by Carrie Doyle is the third book in her Hamptons Murder series but I think it is the best so far. I love that it is about solving a cold case murder that leads to some fascinating circumstances. It has an ominous feel right from the start. Things seem off when Paula asks Antonia to find who murdered her friend years ago and prove it wasn't her. It gets stranger as she starts interviewing the people who were involved years ago with Susie and the stories are not adding up. Antonia has to figure out who she can trust and who she can't and is Paula using her in some cruel game she is playing? I have always thought if I was an investigator I would want to work on cold cases and help families find answers and get justice. that is why this book appealed to me at first. This plot has that element of solving a cold case to help reach justice but it also leads to exciting circumstances in the present day also. The mystery keeps you guessing and has so many possibilities. I like how Antonia is smart, quick thinking but naive too. She tends to jump in.with both feet then wonder what have I gotten myself into. If you like a good mystery, with exciting twists and more than one possible suspect you will want to read this book. It is a good mystery with fun smart characters as well as a few sinister characters too. I enjoyed this one and couldn't put it down. I suggest you read the first two in the series also. I hope you will check it out. I truly enjoyed Death on West End Road, the third book in the Hamptons Murder Mysteries -- it does not disappoint. But first I would recommend starting by just enjoying the beautiful cover of this book, which even has a bit of sparkle to it. My daughter said she wanted to read the book just for the cover alone! Antonia Bingham is on the mend from a serial killer's attack in A Death on Lily Pond Lane, and eager to just enjoy the summer season in East Hampton at her Windmill Inn and Restaurant. Sh I truly enjoyed Death on West End Road, the third book in the Hamptons Murder Mysteries -- it does not disappoint. But first I would recommend starting by just enjoying the beautiful cover of this book, which even has a bit of sparkle to it. My daughter said she wanted to read the book just for the cover alone! Antonia Bingham is on the mend from a serial killer's attack in A Death on Lily Pond Lane, and eager to just enjoy the summer season in East Hampton at her Windmill Inn and Restaurant. She wants to enjoy the glorious East Hampton weather and spend some time thinking about her love life, or lack of a love life. Unfortunately, that is not to be. Because she is getting a bit of a reputation for crime solving, one of East Hampton's wealthiest residents, Pauline Framingham requests her services in solving a cold case from the 1990's where her friend, Susie Whitaker, was murdered on the Framingham's tennis court, and Pauline was the main suspect! Antonia wants to refuse, but Pauline makes her an offer she cannot refuse. With the help of her dear friend, Joseph Fowler, and the often unwanted help of journalist Larry Lipper (yes, Larry Lipper! ), Antonia finds herself visiting the East Hampton of the summer of 1990 in order to try to solve the crime. This mystery has plenty of suspects, and so many twists and turns and evasions, that Antonia has to use all of her resources to try to solve it. The ending came as a complete surprise to me! All of the Hamptons Murder Mysteries are wonderful, and I think that Murder on West End Road is my favorite so far. Don't miss out on this great series which puts your right in the lovely town of East Hampton, both past and present. It's Summer in the Hamptons and Antonia Bingham is busy running the Windmill Inn and Restaurant during the height of the season as tourists stream in for Summer vacation. If running the Inn wasn't enough to keep Antonia busy, Pauline Framingham, a wealthy local resident, asks her help in solving a cold case from years ago. Having suspected Pauline in a previous murder investigation, which left Antonia injured, she is hesitant to take on another investigation. As busy as she is, Antonia agrees to It's Summer in the Hamptons and Antonia Bingham is busy running the Windmill Inn and Restaurant during the height of the season as tourists stream in for Summer vacation. If running the Inn wasn't enough to keep Antonia busy, Pauline Framingham, a wealthy local resident, asks her help in solving a cold case from years ago. Having suspected Pauline in a previous murder investigation, which left Antonia injured, she is hesitant to take on another investigation. As busy as she is, Antonia agrees to look into the murder of Susie Whitaker after feeling that the young girl deserves to know what happened to her...even though Pauline herself was the main suspect in the murder of her BFF all those years ago. While Antonia lived on the opposite coast when the murder took place all those years ago, she is now a local and has friends who help her delve into solving the mystery of what happened and who killed poor Susie all those years ago. Love is also in the Hampton air as Antonia helps a guest find the woman he met the year before and his heart has been pining for over the past year. Even Antonia's love life is looking up...can't wait to see where this leads in future installments! This book grabs you and never lets you go - even to the surprise ending! This third book in the series is even more intense than the first two. If you haven't read the first two you can still read this book as a stand-alone. The first few chapters fill you in on the background, the Inn and the main and subordinate characters - and then you are grabbed and never let go! You are taken on a wild ride of ups and downs, red herrings, lies and deceit, secrets, a cold case, threats, and fear along with This book grabs you and never lets you go - even to the surprise ending! This third book in the series is even more intense than the first two. If you haven't read the first two you can still read this book as a stand-alone. The first few chapters fill you in on the background, the Inn and the main and subordinate characters - and then you are grabbed and never let go! You are taken on a wild ride of ups and downs, red herrings, lies and deceit, secrets, a cold case, threats, and fear along with a taste of romance and craziness. Our heroine, Antonia while running the Inn and restauant and dealing with her employees personalities is asked to look into an unsolved cold case by the person who was the "person of interest" in that murder many decades ago. Will she be able to put the case to rest before it kills her? She enlists the help of her friend and resident at the Inn Joseph, who does some good research for her and looks out for her in his way and Larry Lipper, the reporter whose connections she needs although he is crass and very annoying. Then there is the personal shock Antonia gets. I couldn't put the book down, each chapter leads you to having to see what happens next. AND there were enough loose ends which will, no doubt, be a good part of the next book in this series. Will Antonia and Nick ever really get together? How will Bridget fit into her life? Will her vengeful EX show up and try to wreck the life she has made for herself now? I received an ARC of this book but the opinions here are strictly voluntary. 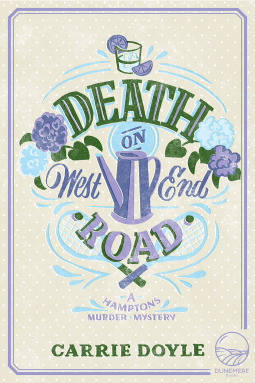 Death on West End Road is the third book in A Hamptons Murder Mystery by Carrie Doyle. Antonia Bingham is an Innkeeper in East Hampton, New York. Antonia is striving at continuing to build her successful business as a local Innkeeper, but ends up being asked by a local to look into a murder that occurred 27 years ago. Antonia has to balance running her Inn and finds herself needing to solve the mystery before other people including herself gets hurt. One of the things that I enjoyed about Antoni Death on West End Road is the third book in A Hamptons Murder Mystery by Carrie Doyle. Antonia Bingham is an Innkeeper in East Hampton, New York. Antonia is striving at continuing to build her successful business as a local Innkeeper, but ends up being asked by a local to look into a murder that occurred 27 years ago. Antonia has to balance running her Inn and finds herself needing to solve the mystery before other people including herself gets hurt. One of the things that I enjoyed about Antonia is how she becomes dedicated to solving this murder mystery even when other problems continue to occur throughout this story. Death on West End Road was a great book that I could not put down because the suspense had me wanting to find out who was the murderer and how different local people were a part of the story. I look forward to reading the first two books of A Hamptons Murder Mystery to see the beginning of Antonia's story and how she got into sleuthing. For my honest review, I received an advanced reader copy. A slow paced mystery packed with interesting characters and an intriguing storyline. Antonia was a softy, that allowed herself to be jerked around by the rich and bored Patricia, because of her curiosity she was still able to rattle a few cages in order to solve the cold old case. Bringing to light a lot of hidden secrets which the killer wanted to remain just that secrets, causing him the to shut down the investigation. Although threatened with legal action if they delved any further into the i A slow paced mystery packed with interesting characters and an intriguing storyline. Antonia was a softy, that allowed herself to be jerked around by the rich and bored Patricia, because of her curiosity she was still able to rattle a few cages in order to solve the cold old case. Bringing to light a lot of hidden secrets which the killer wanted to remain just that secrets, causing him the to shut down the investigation. Although threatened with legal action if they delved any further into the investigation, with the help of her friends Joseph and obnoxious reporter Larry they were able to put closure to an unsolved murder. I was looking forward to more excitement in the story but it was not to be, on a whole, it was an interesting read. This was an interesting story. Antonia is investigating an old case. There were several suspects in the case but no one was convicted. Who murdered Susie? And why? Antonia questions many people that were around at the time of the murder. She asked everyone who they thought did it. The answer in the end was a surprise. This is a very good series and the story flows so well. I'm looking forward to the next one to come out. Thanks for the fun read! Antonia Bingham owns and operates an inn in the Hamptons, and it's a busy place this time of the year. One day she receives a visit from Pauline Framingham, one of the richest people who lives there, and Pauline makes a strange request: she wants Antonia to solve a murder that occurred 27 years ago. Pauline's best friend Susie Whitaker was bludgeoned to death on Pauline's tennis court, and while many were suspected - including Pauline herself - no one was ever found guilty of the crime. While th Antonia Bingham owns and operates an inn in the Hamptons, and it's a busy place this time of the year. One day she receives a visit from Pauline Framingham, one of the richest people who lives there, and Pauline makes a strange request: she wants Antonia to solve a murder that occurred 27 years ago. Pauline's best friend Susie Whitaker was bludgeoned to death on Pauline's tennis court, and while many were suspected - including Pauline herself - no one was ever found guilty of the crime. While there are plenty of suspects, there aren't many clues. Susie was alone on the court, and no one saw anything that pointed to any one person. In the end, it was left as an unsolved crime. The book gets right into the thick of things with details of the cold-case murder on a wealthy Hampton estate. Never a dull moment in this book as our inn-keeper Antonia balances the running of her establishment, her personal life and her attempt to be a Nancy Drew-type detective and solve this long-ago murder. The cast of characters were so well fleshed out my minds-eye could visualize each one. Author Carrie Doyle really does have a knack of bring her characters to life. I found this murder mystery even more of a fast page-turner than the previous two in the series. I must say, I normally read a lot of British murder mysteries but this book rated right up there with the best of them. I had a very hard time figuring out "who dun-it". In my book, that means a lot! Antonia is “done with murders” when she’s approached by Pauline to solve the murder of her best friend, a cold case from many years ago. She is hesitant to agree to the investigation as she is just recovering from an injury. It’s also busy season and she needs to run her inn. Pauline has come to Antonia for help as no one she has hired over the years has been able to get to the truth. She agrees as she believing that the truth deserves to be uncovered…and Pauline has agreed to rent every room in Antonia is “done with murders” when she’s approached by Pauline to solve the murder of her best friend, a cold case from many years ago. She is hesitant to agree to the investigation as she is just recovering from an injury. It’s also busy season and she needs to run her inn. Pauline has come to Antonia for help as no one she has hired over the years has been able to get to the truth. She agrees as she believing that the truth deserves to be uncovered…and Pauline has agreed to rent every room in the hotel during her slowest month. With the help of Joseph and Larry, she begins her investigation…where everyone has an alibi and appears to be hiding something. This is a cold-case mystery (20 years old) set in the Hamptons, home of lots of rich people. One home they mentioned cost $65 million and they talked about tearing these homes down and rebuilding! Crazy! There were several interesting subplots such as an unknown relative turning up and an Italian visitor looking for a woman named Elizabeth. I liked the second subplot. It was enjoyable and Giorgio was nice. I also liked the restaurant and inn setting. A lot of the characters aren't likeable (inclu This is a cold-case mystery (20 years old) set in the Hamptons, home of lots of rich people. One home they mentioned cost $65 million and they talked about tearing these homes down and rebuilding! Crazy! There were several interesting subplots such as an unknown relative turning up and an Italian visitor looking for a woman named Elizabeth. I liked the second subplot. It was enjoyable and Giorgio was nice. I also liked the restaurant and inn setting. A lot of the characters aren't likeable (including one or two who work in the restaurant) but Antonia is. Her friend Larry, a crime reporter who helps her with the case, can be brusque but he's a good guy. At the beginning when Pauline wanted Antonia to solve the case she was determined but later on seemed to be manipulative. Death on West End Road is a mind-bender. I love how Carrie Doyle writes. She sets the stage and makes you lose yourself in the story. It is interesting to see how Antonia begins work on this cold case. I enjoyed how Ms. Doyle went from Antonia doing her job at the inn and investigating on the side. This story kept me glued until the very end. I would recommend this book to anyone who likes cozy mysteries, good storylines and surprise endings. This is the third book in the series and my favorite so far. (It can also be read as a stand alone). It's a perfect summer read and I thoroughly enjoyed it. The setting is the beautiful Hamptons, the characters are engaging and the plot is a good one with plenty of twists and turns. I especially liked the fact that I couldn't determine the murderer before the story ended. This was my first Carrie Doyle and Hamptons Murder book. I read a lot of mysteries, including cozy mysteries, and I am always trying to figure out the ending. This plot captured my interest and caught me off guard at the end. An enjoyable summer read! Another good Hampton murder mystery. This one starts with a cold case and another murder happens. Definitely kept me guessing. The third installment in the Hamptons Murder Mystery series is still flourishing in regards to the descriptive details of the town, and the scrumptious food that is made at the main character’s, Antonia’s, inn and at other restaurants in the area. I didn’t feel as if there was as much character development for the recurring characters as there has been in the previous two books. Antonia was so busy buzzing around town looking for clues, that it didn’t leave as much time for the reader to get to The third installment in the Hamptons Murder Mystery series is still flourishing in regards to the descriptive details of the town, and the scrumptious food that is made at the main character’s, Antonia’s, inn and at other restaurants in the area. I didn’t feel as if there was as much character development for the recurring characters as there has been in the previous two books. Antonia was so busy buzzing around town looking for clues, that it didn’t leave as much time for the reader to get to know them even better. While Carrie Doyle’s descriptions of the characters, as well as their dialogue was done very well, I just wish we got to read more about the wait staff, Joseph, and her best friend. There was a lot of movement with the love interest though, so I am looking forward to reading about that in future books. And Doyle left even more sinister clues about Antonia’s ex-husband, so when he finally shows up, that should be very interesting. I didn’t feel as emotionally attached to the murder victim and the various people that Antonia had as suspects as I did in the previous books. It could be because many of them were rich, and could have changed their situations, if they had been better people. The revealing of who did it was interesting, and I didn’t see part answer beforehand. Another good book in the series, and I’m interested in what Doyle will have in store for us next. Yet again I am super impressed with Carrie Doyle and her Hamptons Murder Mystery Series!! You never know what is going to happen in East Hampton no matter what time of the year. It's Summer now and the busy season is starting at the inn but that isn't stopping Antonia from using her skills as a mystery solver to help find the killer of gal in the 90s! The crazy thing is, is the info Antonia is getting from Pauline Framingham true or is a ruse for something else? The story is fantastic and very ha Yet again I am super impressed with Carrie Doyle and her Hamptons Murder Mystery Series!! This is the third in A Hampton Murder Mystery series but is a great stand alone too. Antonia is the perfect cozy mystery sleuth. The author has given her just the right amount of day job - in this case the owner and chef at an Inn and also a great back story - not great relationships with men including a bad ex husband. All of this just adds to the readability of the series. The re-occurring lesser characters just enhance the story line and the enjoyment. Carrie Doyle is a talented author who has combined many of her interests – mystery and crime novels, cooking, and general nosiness – into her creation of the Hamptons Murder Mystery series starting Antonia Bingham, a foodie innkeeper and reluctant detective. Death on West End Road , the third of this fast-paced series was published just yesterday by Dunemere Books. The first two, Death on Lily Pond Land and Death on Windmill Way, were released back to back last year. While each mystery of the series can be enjoyed as a stand-alone read, I made it a point to devour the first two before tackling the third. This way, I could trace Antonia’s story and that of Doyle’s other intriguing characters to fully appreciate the intricacies of main and sub- plots for each succeeding novel. I am glad I did because characters in the first book appear, disappear, and reappear in the second and third – ore developed and complex as they weave in and out of Antonia’s life. Much like people in real life weaving in and out of one’s own spheres of reference. I adore Antonia, by the way. She is a delightful combination of Melissa McCarthys ’chief chef character in Gilmore Girls, Agatha Christies’ Miss Maple (although forty years younger), and Columbo (remember him?) She isa tough, tenacious, intense, slightly overweight 36-year-old with a warm heart and a healthy sense of what is right and wrong. And her adventures in solving crimes – especially murder – are filled with wit and wonder. Which proves that Doyle, herself, is a great writer whose plot lines, as well as her characters – which and who are seemingly predictable – are chock full of twists and turns and surprise endings. Just to give you a few teasers. In book one, Antonia solves the mystery of the murder of young documentary film maker. We meet her, the supporting staff of her inn and restaurant on Windmill Way, and her annoyingly persistent cohort in crime, the local journalist Larry Lipper (an apt name for his royal rudeness). Joseph, a much older history writer, enters the picture; as well as Genevieve, Antonia’s best, but often ditsy, best friend. We also meet a nearly improbable love-interest, Nick Darrow, who is a famous Hollywood actor. In number two, the case is cracked of the deaths of previous owners of Antonia’s inn. She thinks she is next. But is she? We meet again Gen, Nick, and Joseph… and Pauline Farmingham who is the primary suspect in the murder of her best friend on her family’s tennis court. In book three, Antonia is hired by Pauline to find the real murderer, only to be thwarted every step of the way by her erstwhile employer. Finding out why – and how – is the crux of a “never-saw-that-coming” denouement that had me racing to get to the last page. This, folks, is mystery/romance fiction at its captivating best – right up there with Aunt Dimity! – all couched in the resplendent – as well as mouth-watering – diverse and interesting culture of the Hamptons. These reads are so almost real, you’d think you were actually in the Hamptons sitting in Antonia’s restaurant... without ever having to pack. “Death on West End Road” earns 5/5 Old Money Mysteries! Antonia Bingham, gourmet chef and owner of the Windmill Inn, just wants to enjoy the summer recuperating and greeting guests whose only goal is “to tan and dine and play in the Hamptons.” However, Pauline Framingham has other ideas. Knowing that Antonia was key in solving a few murders, Pauline was adamant that her friend Susie Whitaker, found bludgeoned on her tennis court decades before, be given some justice. Well, justice for all since P “Death on West End Road” earns 5/5 Old Money Mysteries! Antonia Bingham, gourmet chef and owner of the Windmill Inn, just wants to enjoy the summer recuperating and greeting guests whose only goal is “to tan and dine and play in the Hamptons.” However, Pauline Framingham has other ideas. Knowing that Antonia was key in solving a few murders, Pauline was adamant that her friend Susie Whitaker, found bludgeoned on her tennis court decades before, be given some justice. Well, justice for all since Pauline, then seventeen, was their number one suspect, and some think, like in the movies, she had excellent lawyers and may have beaten the rap. Despite her reticence to get involved in another murder, Antonia had to admit she did have the skill. Pauline knew Antonia would end up investigating, and dropped a bombshell that she believes the real killer is a friend of Antonia’s to make sure. It worked…she has become very curious about this very cold, cold case. The local ‘know-it-alls’ had lots of opinions, her go-to investigator and crime reporter for the local paper shared information from the original beat reporter at the time, and Pauline herself gave a detailed account of what happened that day. There were discussions and research all indicating more motives for the murder, but the alibis were just as prevalent. Antonia becomes emotionally invested as she learns more about the victim, but someone seems to be getting nervous that she just might uncover the truth.